When one studies early American psychological operations (PSYOP) campaigns we constantly find that one of the complaints is that the personnel was usually drafted or assigned from another specialty such as infantry, armor or artillery. The problem has been met head-on today with American PSYOP troops trained in specialty schools at Fort Bragg, North Carolina, and having their own military occupational specialty (MOS) code. It was much more haphazard in WWII and Korea. In this article we will look back six decades and study the career of one Psywarrior who started out as an U.S. Army infantry officer and later requested and was assigned to a PSYOP unit during the Korean War. His son has been kind enough to send me a collection of his wartime orders and documents and we have put this story together from reading the orders and personal correspondence. Murray Jack Litin was born in the Bronx, New York, on 21 March 1928. He graduated from Freeport High School on Long Island and later earned a Bachelor of Science degree from Syracuse University. He did two years in the U.S. Army as a medic from 1945 to 1947, achieved the rank of Private First Class, and then returned home to several civilian jobs in various retail firms while he completed his schooling. During his university time he spent two years in the Reserve Officers Training Corps (ROTC) and did six weeks of field training during his summer vacation. On 28 January 1951 he was appointed an infantry 2nd Lieutenant in the Officers Reserve Corps by direction of the President.Murray had achieved the exalted rank of Butter Bar. In February he was attached to the 305th Infantry Regiment of the 77th (Reserve) Infantry Division. They met on 42nd Street in New York City, just a bit west of Times Square. On 5 June 1951, Litin requested an assignment in Psychological Warfare (PSYWAR). The Department of the Army informed him that there was no need for additional personnel at the moment but his request would be retained. They advised him to read Training Circular 17, The Military Aspects of Psychological Warfare. They also appear to have sent him the PSYWAR Officer Course curriculum, 317 hours that included: Journalism, Radio, Advertising, Publishing, Public relations, International Relations, Diplomatic Service, United States Army Staff and other subject allied to political or psychological warfare. They state that WWII experience in PSYWAR, or service with the Office of War Information or Office of Strategic Services is desirable, as is fluency in one or more foreign languages. In October 1951, Lt. Litin requested an assignment to the Counter Intelligence Corps at Fort Holabird, Maryland. He points out that he has a clean record, has an anticipated 18 months to serve, had served in the German prisoner of war camp at Fort DuPont, Delaware, during his first tour, and had completed a voluntary extra-curricular course in intelligence training for ROTC students sponsored by the G-2 (Intelligence), First Army. His request was denied by First Army who pointed out that he just had a few months in the infantry and should have at least one years experience before requesting a transfer. At that time Litin was assigned to the 526th Replacement Company at Camp Kilmer, New Jersey, as an assistant to the commander. Repo Depots normally are holding companies where troops wait before being assigned a permanent position. For instance, Litin was in charge of transferring a group of enlisted soldiers to Fort Gordon, Georgia, on 6 November. I suspect that the young lieutenant hated the job. On 13 November 1951 he was assigned to the 9th Infantry Division. 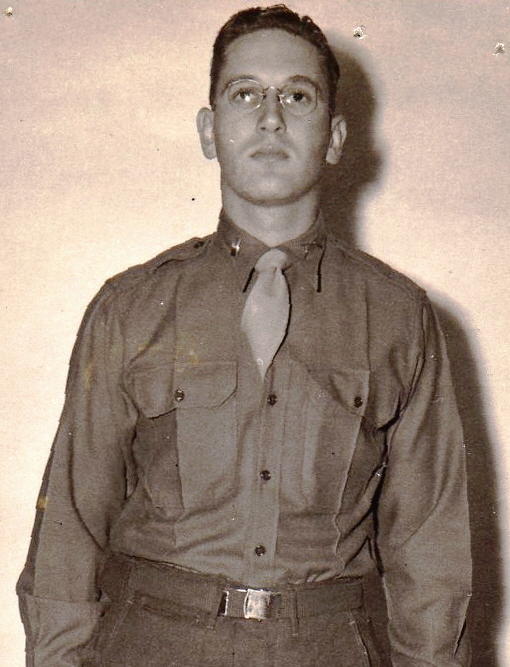 In March 1952, Lt. Litin received orders to attend the three-month officers Infantry Course at Fort Benning, Georgia (often called the Benning School for Boys by the old soldiers). The Infantry School would teach the young lieutenant the finer points of his trade. Litin graduates and clears the base on 25 June. He then receives orders for the Third Army 6th Radio Broadcasting and Leaflet Group at Fort Bragg, North Carolina. He probably got his enthusiasm for propaganda there. While at Bragg he is assigned to special duty with the 10th Special Forces Group. I notice that Colonel Aaron Banks is on the same order, assigned as the Executive Officer of the PSYWAR Center. Aaron Banks is considered by many to be the father of the United States Army Special Forces. In July 1952, Litin was assigned to the twelve-week PSYWAR Officers Course. His orders state that he will report to the Commander of the PSYWAR Center after graduation for assignment. 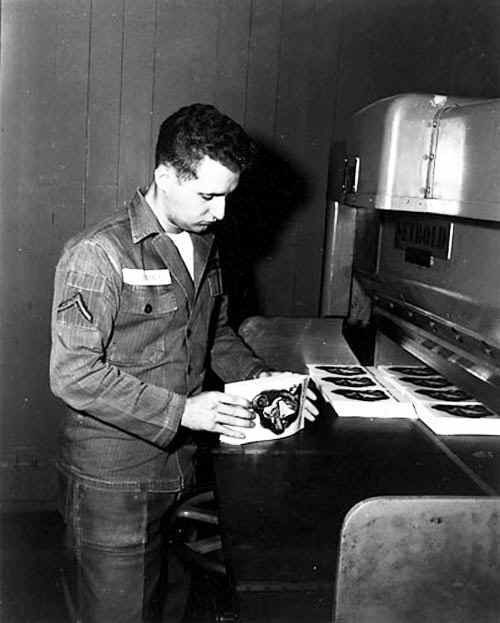 He graduates and is promptly assigned to the 2nd Loudspeaker and Leaflet Company of the 6th Radio Broadcasting and Leaflet Group at Fort Bragg. On 22 November 1952, Litin is assigned to the 6217th Replacement Battalion at Fort Lawton, Washington. He also accepts the appointment of a Reserve Army officer for an indefinite term. Litin is then assigned to the 3rd Reproduction Company, APO 503, of the 1st Radio Broadcasting and Leaflet Group, 8239th Army Unit, APO 500. He has finally reached the war. His assignment appears on Special Order 353, dated 18 December 1952. On 22 December 1952 his new unit reports that he has arrived. 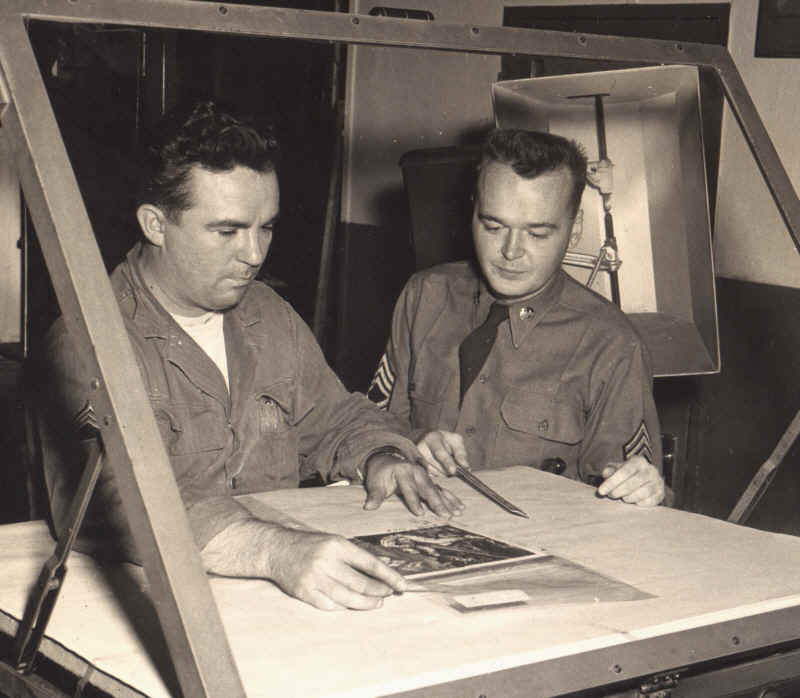 The Army, to find enlisted men for jobs that required a university degree, set up a special classification and assignment unit at Ft. Myer, in Arlington, Virginia. Towards the end of 1950, orders went out to send all draftees with college degrees to Ft. Myer after they finished basic training to be interviewed for possible special assignments. It was through this process that draftees with experience in journalism, radio, advertising and graphic arts found themselves in the 1st RB&L Group. The unit was formed in Ft. Riley Kansas. It was created by Fifth Army General Order #176, April 1951. The first commander was Lieutenant Colonel Homer E. Shields, former Chief of Psywar section of the Sixth Army Group, and later Executive Officer to General McClure, head of the Psychological Warfare Division, Supreme Headquarters, Allied Expeditionary Force (SHAEF). General McClure personally selected Shields for this post. The Group arrived in Tokyo, Japan, on 6 August 1951. They were headquartered on the 6th floor of Empire House. The enlisted personnel were quartered in the Japanese Government Finance Building on B Avenue in the heart of Tokyo. The Officers were billeted in Officer's Clubs around Tokyo. 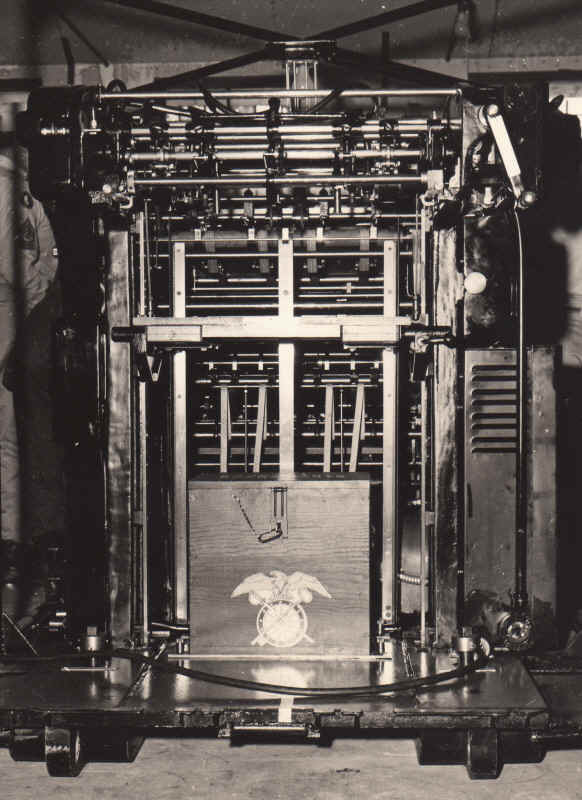 The Headquarters and Headquarters Company contained the command, administrative, supervisory and creative personnel necessary for propaganda operations. 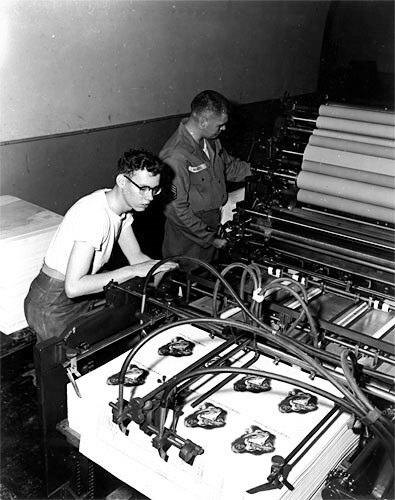 The 3rd Reproduction Company contained intricate equipment and skilled personnel capable of producing leaflets and newspapers of varying sizes and multiple color. The 4th Mobile Radio Broadcasting Company was designed to replace or augment other means of broadcasting radio propaganda. When the unit arrived in Japan in August 1951, it was still inexperienced in the aspects of PSYWAR. The training they received in Korean customs, language, and social details was also inadequate for the job. The early emphasis was on quantity, not quality. 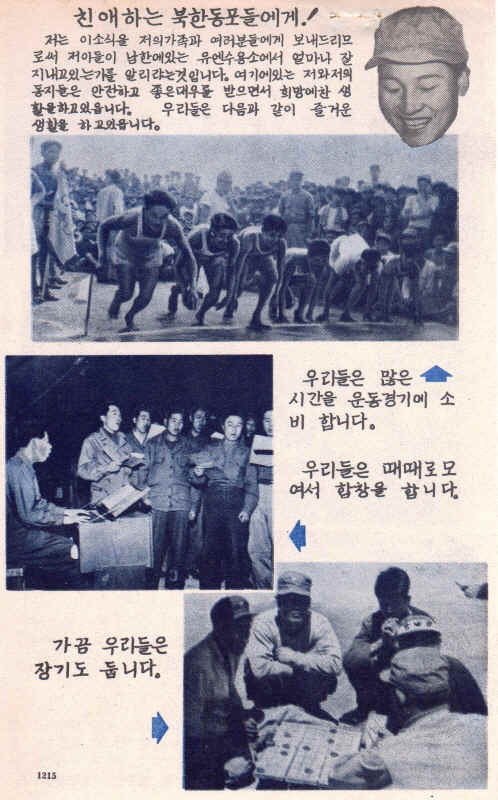 Later, Korean nationals helped in the design and targeting of the materials. 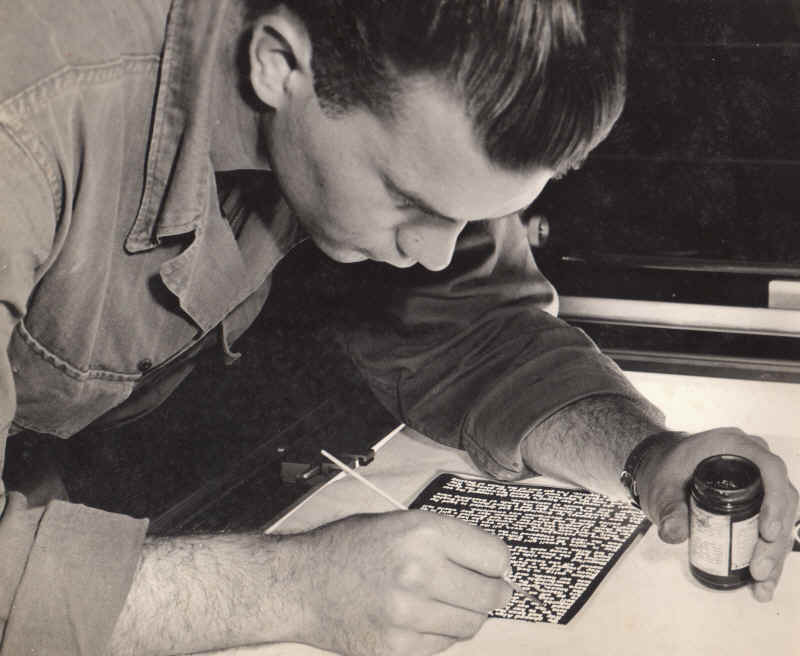 By 1952, the 1st RB&L Group could produce leaflets in 16 languages and dialects. 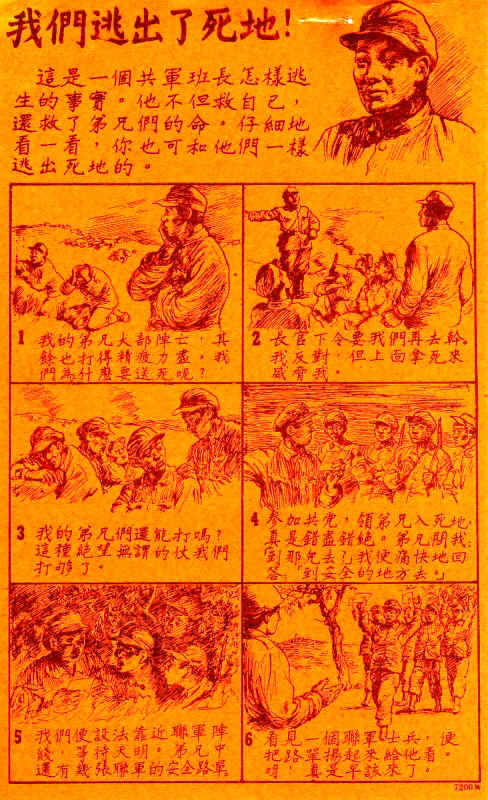 In its disseminated messages to the communist target audiences, whether through loudspeaker, leaflet, or radio broadcast, themes that were stressed included: surrender to receive better treatment; surrender and live to see the end of the war; the superiority of UN firepower; and inevitability of defeat of the communist forces. The Printing of leaflets was the responsibility of the 3rd Reproduction Company of the 1st RB&L Group. Leaflets were prepared at the Far East Command Printing and Publication Center outside Yokohama near a railroad station called Motosumiyoshi. About 250 Americans and 900 Japanese civilian employees worked in the Center. 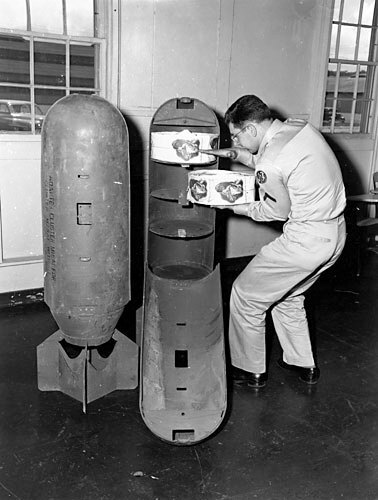 After the leaflets were printed and cut they were rolled and placed inside leaflet bombs by the 3rd Reproduction Company troops. They were then delivered to Tachikawa Air Base to the planes that dropped them on the Chinese or North Korean troops. From August to September 1951 the Group produced about 13 million leaflets a week. By December 1951 the 50-millionth leaflet was produced. 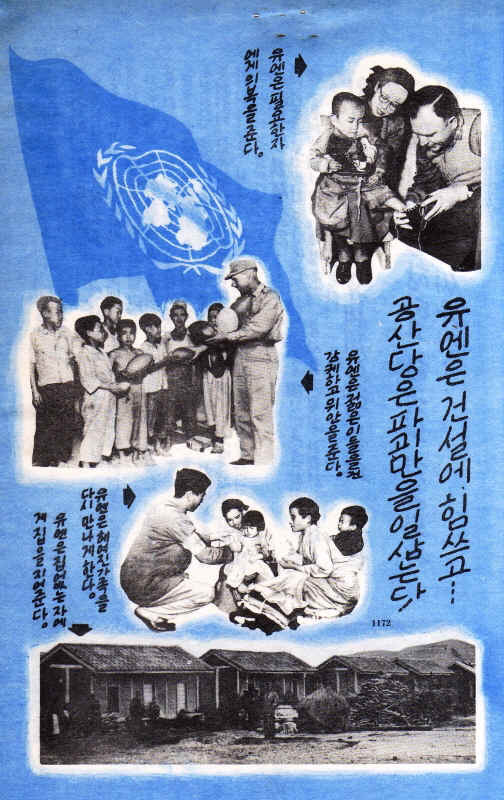 Meanwhile, in Korea, the leaflet missions were planned and organized by the Operations Officer, Kimpo Air Base, Seoul. It is a distinct pleasure for me to commend you for the fine work done in connection with the printing and processing of leaflet 1285. This leaflet is interesting because apparently it was a high-priority rush job. Telling Koreans to stay off the roads and flee to the hills does not seem to be a priority. Asking them to help pilots is noble, but not a priority. So, we can assume that it was the partisan message that was important. What do we know about Allied partisans operating behind the lines in North Korea? 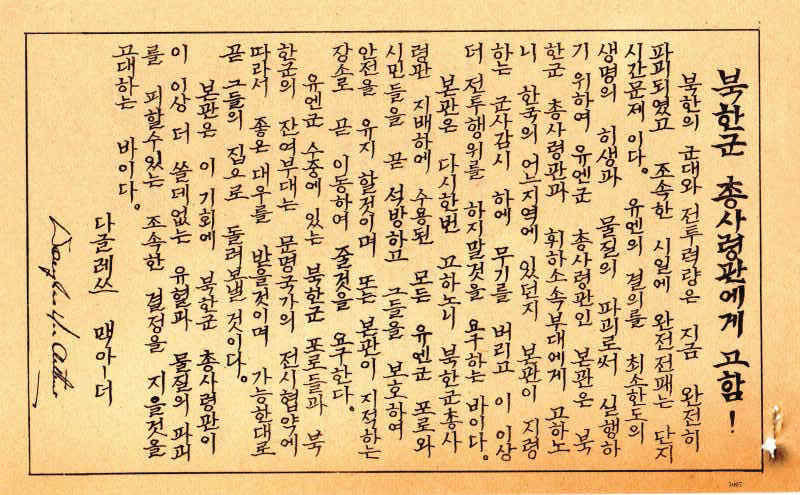 The U.S. Army and the CIA bitterly fought for control of clandestine action in North Korea, and eventually agreed to form Combined Command Reconnaissance Activities, Korea (CCRAK). 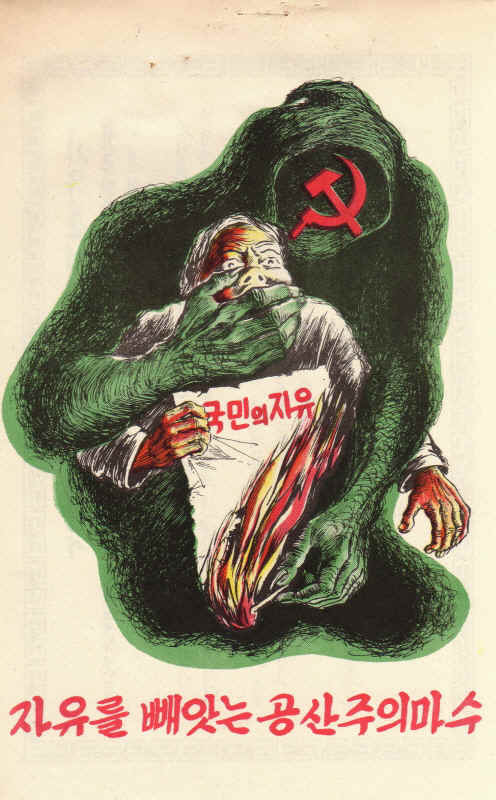 This was a cover name for a classified designation, Covert, Clandestine, and Related Activities  Korea, which was intended to be a joint army and CIA operation with the CIA in overall charge, and with the Air Force and Navy supporting the execution of missions. By January 1952, when CCRAK was activated, actual control ended up with the Armys Far Eastern Command Intelligence Section. 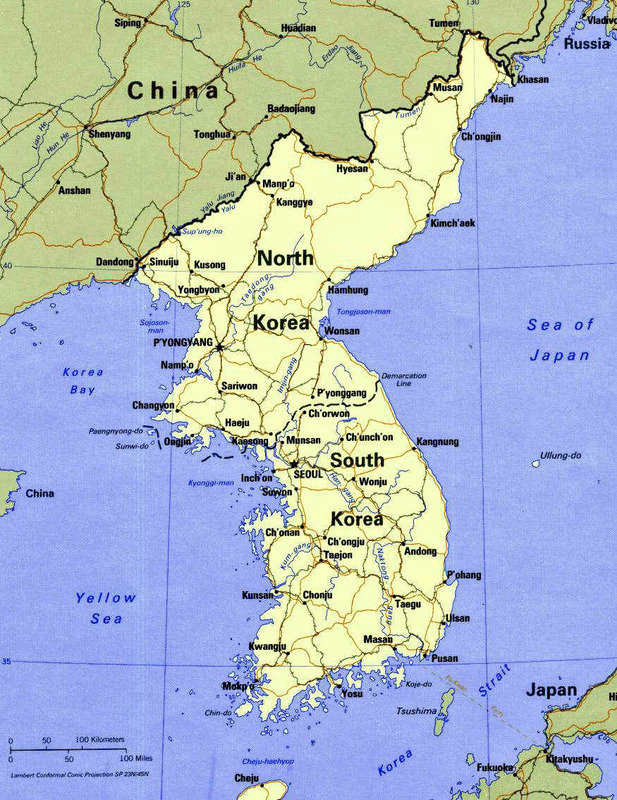 The CIA promptly formed a new unit, Joint Advisory Commission - Korea (JACK), nominally under CCRAK but in reality operating independently from Yong Do Island, connected by a rugged isthmus to Pusan. 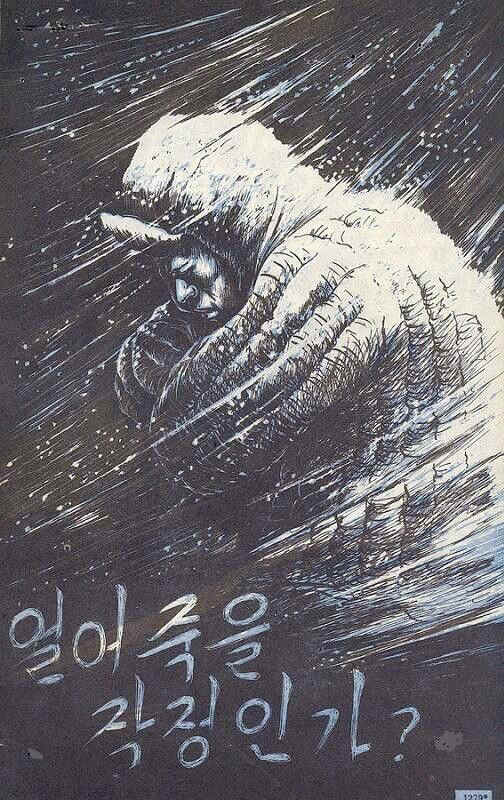 This smoldering distrust continued throughout the Korean War. The partisan is fighting for your liberation from Communist aggression. Protect the partisan and he will protect you. Litin seems to have fitted in well with his new unit and was assigned a number of additional duties, what we used to call onion skins because they were usually the seventh or eight carbon copy of an order typed on very thin paper and almost unreadable. Some of his additional duties were; Unit Fund Custodian, Unit Fund Council, Printing Officer, and Reproduction Officer. 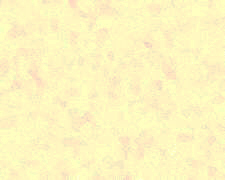 I am particularly anxious to continue in my present assignment as Company Commander and as a reproduction officer as the undersigned is convinced that he is now gaining a unique knowledgeand experience of great value personally to my use in the service. My present assignment not only includes the responsibility of Company Commander but also military printing plant duties, and is providing me with a wealth of knowledge in the field of personnel management, production control, scheduling, and printing plant operation. It is my earnest desire to remain in my present assignment in order to carry on through the period in which the parts played by psychological warfare and the 3rd Reproduction Company are increasing. I feel that my technical knowledge can best be utilized in my current assignment and will be more benefit to the service under the present conditions existing in this theater. Although I have several articles on the Korean War on this website, I will show a few items here that Murray Litin brought home. It would be nice to think that he helped in the design, printing or production of these leaflets. 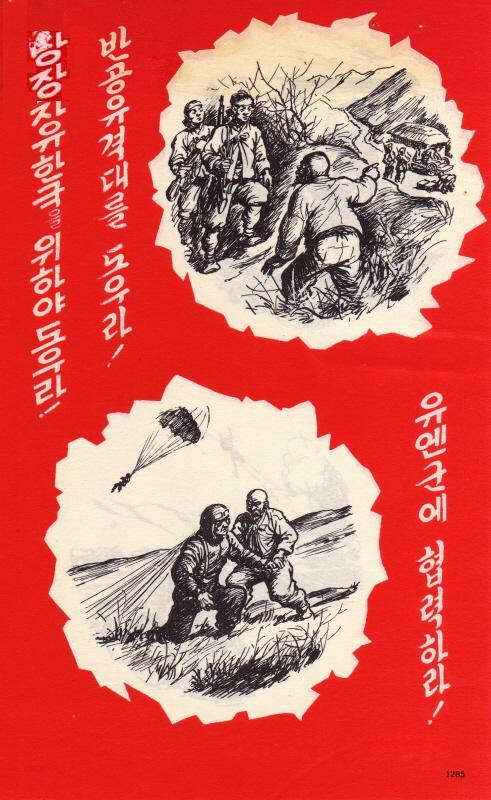 I have selected one or two of the more colorful leaflets from different psychological warfare campaigns. The Communists have refused to allow the International Red Cross to bring desperately needed aid to your suffering families. The Communists have ruined your families and sold your country to Soviet Russia! The Communists are masters of deception! While the UN Builds  the Communists Destroy. The UN  Champions of Peace! Defenders of Freedom! The main purpose of the United Nations is to maintain peace throughout the world. The UN has achieved peaceful settlement of differences in Kashmir, Palestine and Indonesia. Look around  your sons lost to the ruthless Communist army, your crops and individual freedom lost forever. This is only the beginning of your suffering under Communist dictatorship. Join the people of the free world along with your friends. 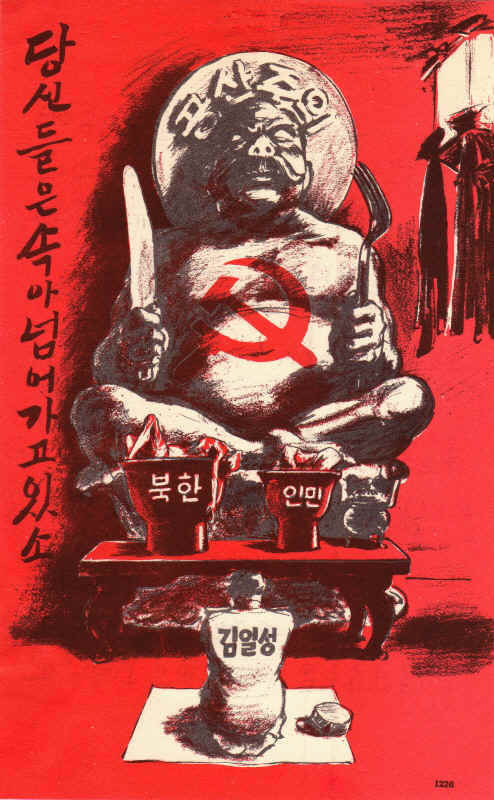 Resist the Communists and build a free and independent Korea. 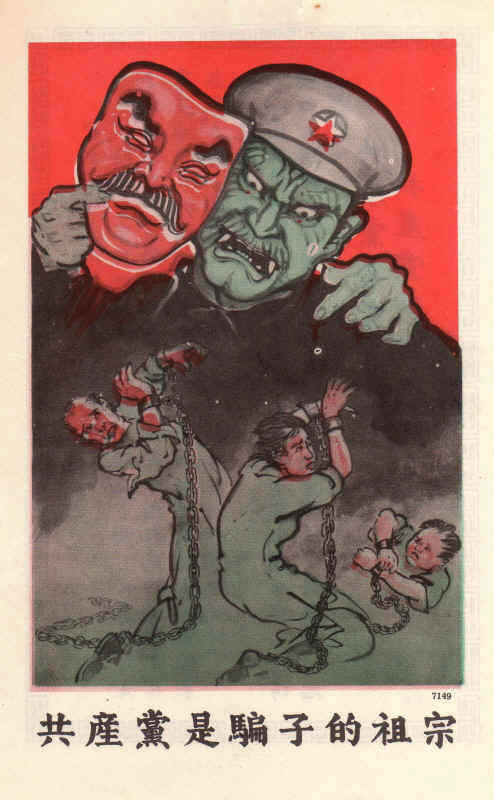 But quietly the Chinese Communists have let in Soviet Russians to enslave China. 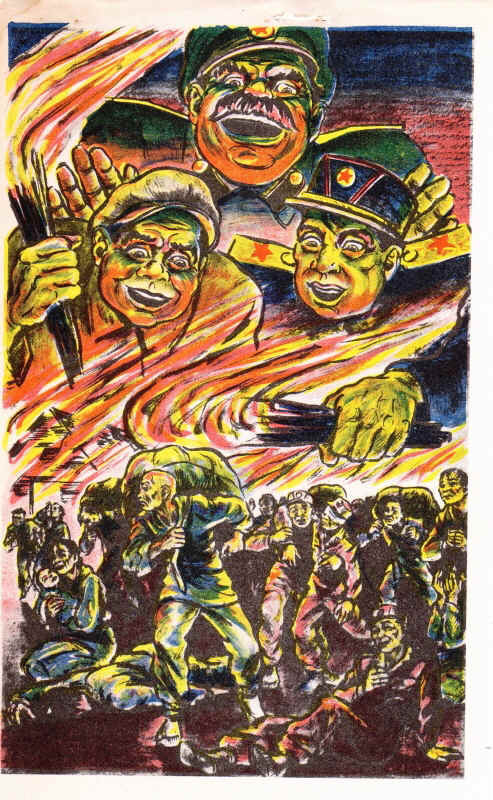 The heavy industry of Northeast China and the food of China have been moved out by the big noses. The Soviet Russians have dispatched advisors to occupy all the key cities of China and have sent secret agents to control both central and local governments. The Communists have ruined your families and sold your country! You know for a fact that two years ago on 25 June 1950 the North Korean Communists ruthlessly attacked the peaceful republic of Korea. 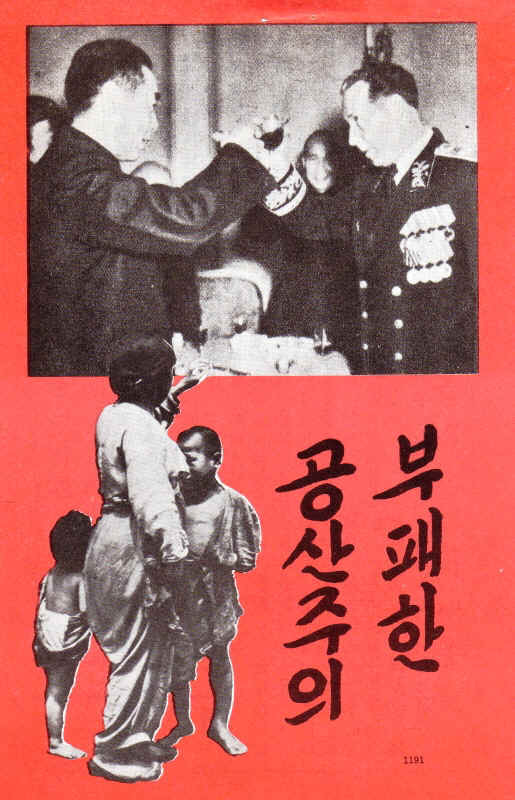 You know for a fact that the war was nearly over in mid-November 1950 when Communist China invaded Korea. 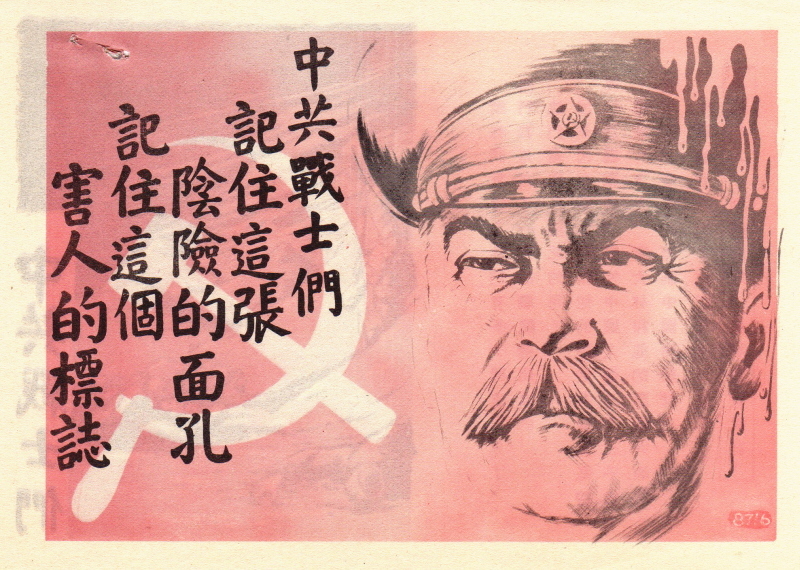 This leaflet also exists with Chinese text coded 7152. Communism breeds corruption, inefficient and incompetent leaders. The facts show this is true. Communist hands take your freedom. Communist hands clamp your mouth shut. You cannot speak out against your Communist bosses. Communist hands chain you to your jobs. You cannot choose where or how long you must work. Escape the hands that kill freedom! British researcher Lee Richards found a number of official U.S. Army photographs showing the development of this leaflet. It is rare to find a sequence like this. Why must your leaders bow to Russian masters? Because in their own greed they have sold themselves to a foreign power. I am sending this message to my family, friends and countrymen so you will know about my life in a UN POW camp in the Republic of Korea. My comrades and I are safe, well cared for and happy. We enjoy ourselves in many ways. We spend much time in sports. We often get together and sing. Do you want to perish? To save your life, escape to the United Nations or to the rear NOW! TOMORROW MAY BE TOO LATE! I shall anticipate your early decision upon this opportunity to avoid the further useless shedding of blood and destruction of property. Read this actual account of a Communist Chinese Forces squad leader who not only saved his own life but the lives of his men as well. This account will show you how you too can escape death. Most of my men were slaughtered. The rest were very tired. Why must my comrades die? For what? Then came the order for my tired squad to return to the battle. I protested and was threatened with punishment. My men fight? They have had enough of this hopeless futile war. I realized how wrong I was to have joined the Communists. How wrong I was to have led these men into battle. I called them together. Where are we going? they asked. To Safety, I replied. We managed to move near the UN lines and waited until dawn. Two of us had saved UN Safe Conduct leaflets. Displaying our leaflets, my men and I approached a UN soldier. Why couldnt we have done this sooner? Criticism and Self-Criticism is mental Torture! You Suffer from Unbearable Loss of Face! Self-criticism was a way for the Communist cadre to mold and lead the soldiers using peer pressure to make them conform. However, it is clear that soldiers taking part in self-criticism were not happy. It was said that they would rather be beaten then suffer the loss of face of being berated before their comrades. BEHOLD THE MURDEROUS SYMBOL AND CRAFTY FACE OF YOUR BETRAYER! 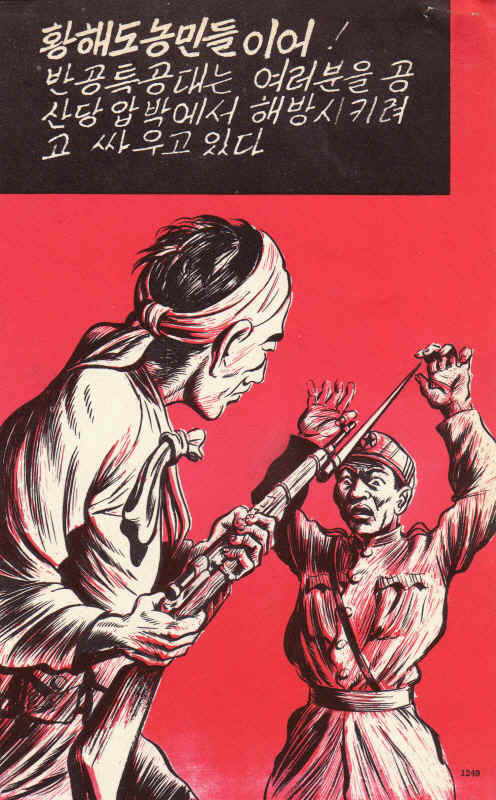 Warriors of the Chinese Communist Forces! Look about you! Many of your comrades are gone, killed in useless attacks. There was one leaflet newspaper in the material that Litin brought back. 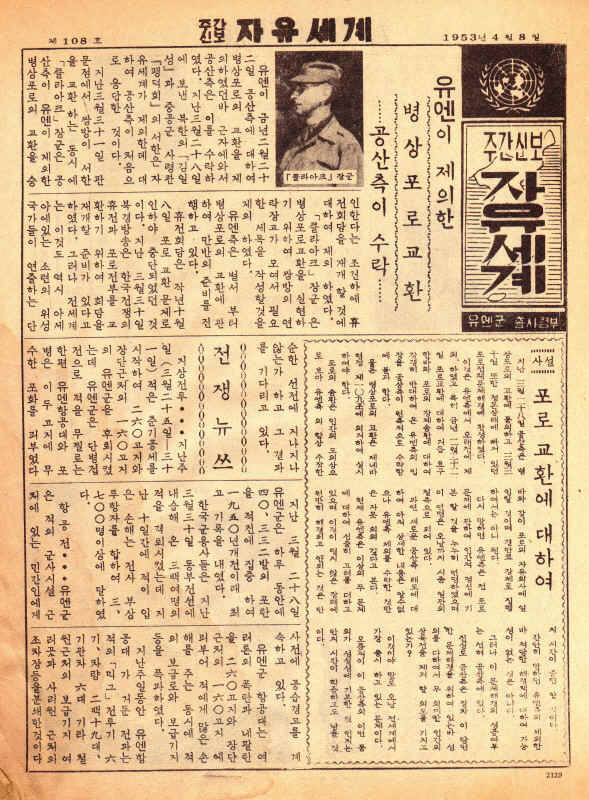 It is a copy of the weekly Free World Weekly Digest for 8 April 1953. 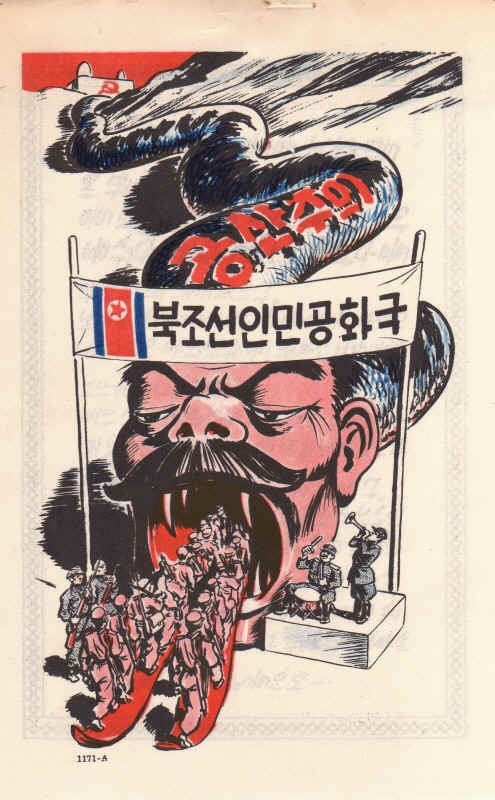 This paper was dropped regularly on North Korean civilians and the North Korean Army and contained photographs, cartoons and various news stories. The above newspaper is issue number 108. On 29 April 1953, Lieutenant Litin received orders to return home. The Army was ready to send him back to civilian life. The North Korean Communists had returned to the Panmunjom peace talks three days earlier and it looked like the war might be over. In fact, fighting flared up again and it was July before the war was actually over. I should point out that no peace treaty has ever been signed so technically theUnited States is still at war with North Korea. At the same time, Congress never officially declared war so the whole flare up was usually called a Police Action doing the shooting phase of what I personally believe meets all the qualification for a war. The bottom line is, Murray was coming home. He cleared his base on 1 May 1953 and was sent to the Camp Drake Replacement Depot to await his paperwork. He was to return to the continental United States and report to Camp Stoneman, California. Orders dated 2 June 1953 send Litin back to Camp Kilmer, New Jersey, for release from active duty. His orders show that he sailed on the USNS General Randall from Yokohama, Japan with the destination of San Francisco, California. His orders show that he was leaving the 3rd Reproduction Company (8239 Army Unit). 1st Lieutenant Murray Litin kept involved in the Army after his second tour. He was called up for annual active duty training (ADT) in August 1957. At that time he was assigned to the 354th Radio Broadcasting and Leaflet Battalion in the Bronx, New York with Headquarters at 529 West 42nd Street, New York City. 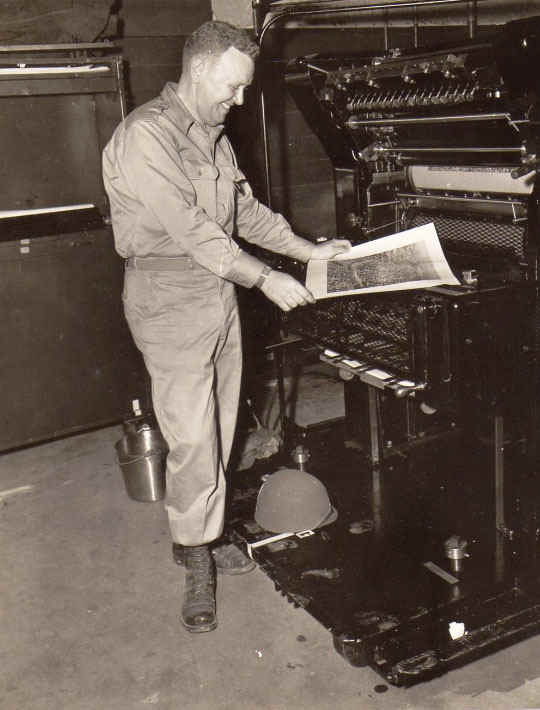 Other orders show during the time he was with the 354th he acted as Propaganda Platoon Leader, Chief of the Printed media Section, and Battalion S4 (Supply). Murray Litin was promoted to the rank of Captain while a member of the United States Army Reserves. His awards and decorations include the World War Two Victory Medal, the National Defense Service Medal, The Korean Service Medal, the United Nations Service Medal (Korea), the Korean War Service Medal and a Korean Presidential Unit Citation. The Reproduction Company of the Radio Broadcasting and Leaflet group is responsible for the reproduction of leaflets and other printed material in support of Group operations. It supports not only strategic but tactical propaganda operations. It prints both strategic leaflets and air-drop newspapers for air delivery and tactical leaflets which are sent to the front lines for artillery delivery. The Reproduction Company consists of three officers and fifty-four enlisted men. The Company has two components. Company Headquarters, which consists of two officers and five enlisted men. Reproduction Platoon, which consists of one officer and forty nine enlisted men and is broken down into four sections; Platoon Headquarters, Camera and Plate Section, Press Section and Processing Section. The Reproduction Company is stationary and only moves when Headquarters moves. 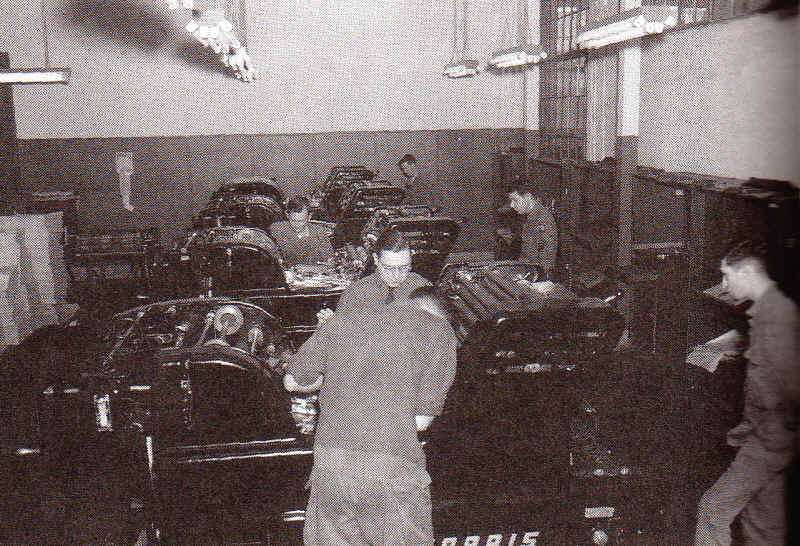 The Reproduction Platoon operates in the field, setting up and operating its presses and other equipment in vehicles. Murray Litin passed away in July, 2003. He was survived by his wife, Estelle Litin; a son, Dr. Russell Litin; a daughter, Lisa Litin Kruger; and four grandchildren. This is just a short article I wrote to honor Lieutenant Murray Litin whose son had his papers but wondered what they all meant. Russ Litin said to me, Looking at this stuff makes me wish I had asked my father about his service while he was alive. To Russ the pile of flaking orders and documents in military terminology were incomprehensible. I looked at them and saw clear as a bell the entire military history of a man. It was like looking at a soldiers chest full of badges and ribbons immediately knowing where he had been and what he had done. It is a soldier thing. It was a great pleasure to put it together and write this story. Comments are encouraged. Please contact the author at Sgmbert@hotmail.com..